I’m a religious listener of Podcasts and I’ve just finished season two of Start-Up. Although the content of the podcast is stellar and the story throughout the season is captivating, it was actually one of the adverts that caught my attention in last week’s episode. A representative from the Ford Motor Company spoke about their bio-materials team, a group of engineers who are passionate about recycling everyday waste and turning it into car components and accessories. The team take junk items like old money and cigarette butts, plus waste by-products like wheat straw fibre and and rice hulls and use them to develop renewable materials for their cars. I’m not kidding, they make electric harnesses, storage beans and seat cushions from this every day junk! Their ultimate goal is to create an entire electric vehicle interior from renewable materials. Pretty cool, right? 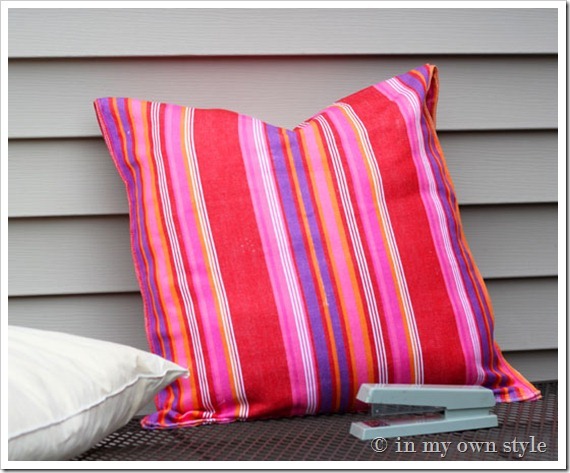 Once you’ve create the cushion “filling” from old plastic carriers, you sew a cushion cover. Blogger Diane used cheap printed tea-towels from her local dollar store, but you could recycle fabric from your home. (Like that old maxi dress, denim jeans that no longer fit or simply use offcuts from your sewing box). I’ll be making a couple of these before my outdoors get together later this month. I run them through the dishwasher and tie a little ribbon around the top. Voila. My boyfriend and I both have one each on our desks, holding pens (I tied some masculine, striped beige/brown ribbon on his!) We also have a pot on our coffee table holding remote controls. I also save the small glass pots from those indulgent chocolate desserts. They’re good for holding loose change and washi tape, or for putting tea light candles in. In a similar vein, you can recycle tin cans for a number of purposes too. Spray paint them in your favourite colour and decorate to your taste. 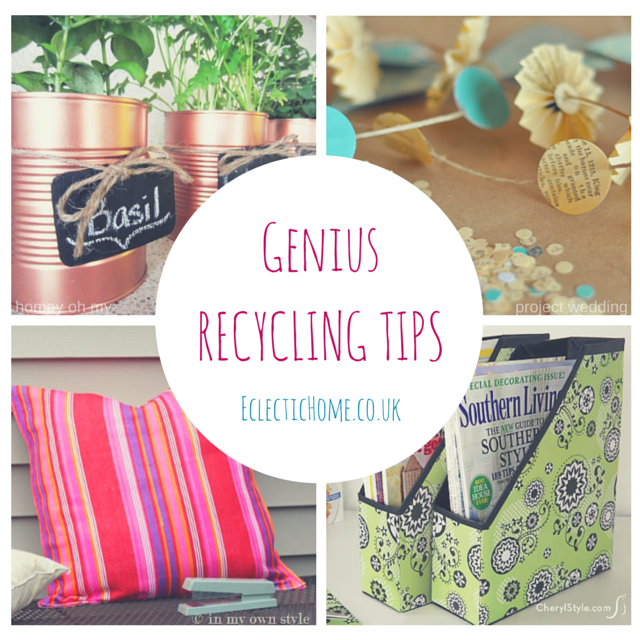 Use upcycled tin cans to hold utensils during a summer BBQ; to organise make-up brushes on your dressing table; to provide a place for people to dump their keys and spare change by the front door… The possibilities are endless. 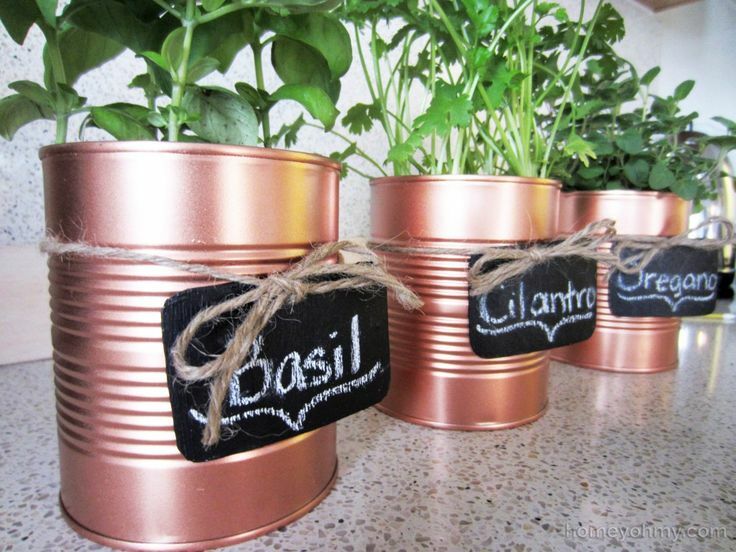 Here’s one of my favourite tutorials – the tin cans are sprayed with metallic copper paint, fixed with chalkboard tags and used as herb planters. Have you redecorated your home recently? If so, you may have heaps of paint chip and wallpaper samples lying in a draw somewhere. Don’t throw them away! They can be recycled into beautiful artwork for your walls. Simply punch, arrange, glue and frame. Here’s the original tutorial from Fiskarettes UK. 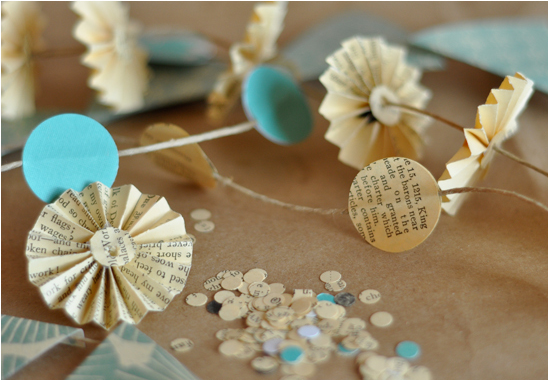 The artwork above can be made with any scrap paper or card lying around the home too. You could clip shapes from advertisements in old magazines, pages from old books, birthday cards and even flyers put through your door. If you have a family, you may go through countless boxes of cereal each month. 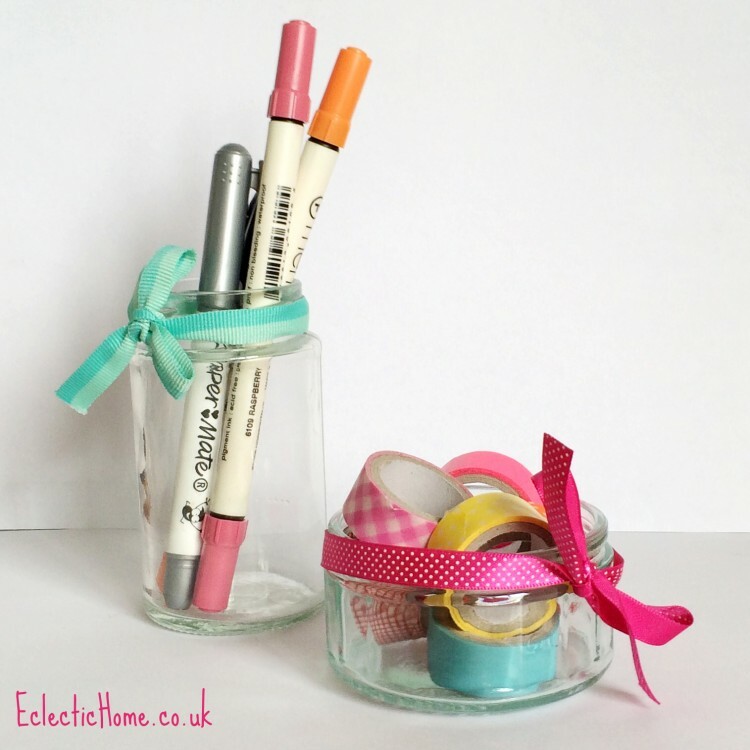 Don’t throw them away, upcycle them! Cut your boxes up and cover them in craft paper. 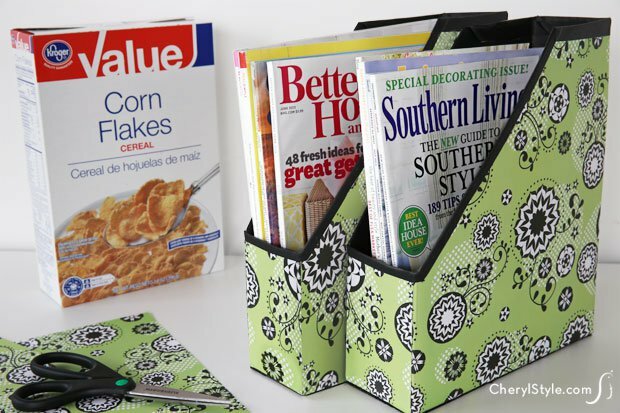 They make attractive magazine holders! Tutorial here. Use for more than weekly glossies – use to organise bills, letters home from school, recipe clippings and more. Do you have a box full of miscellaneous wires and old electronics that you never use, but haven’t got around to throwing away? I have. I know there are at least two old digital cameras and several mobile phones in my box, no longer loved due to shiny new upgrades. Don’t let them end up in the landfill! Recycle them! If your phone or gadget is still serviceable, try giving it away to a good home on Freecycle first – another family might appreciate your camera or phone, no matter how out-of-date it is. Some companies buy old gadgets to refurbish and sell on. You might only receive £5 or £10, but at least your phone won’t end up in the landfill and you can put the money towards something for your home. Check if your electronics are worth anything by running it through a tool like compareandrecycle.co.uk. If your phone isn’t worth much, or you can’t shift it on Freecycle, there’s a third option. 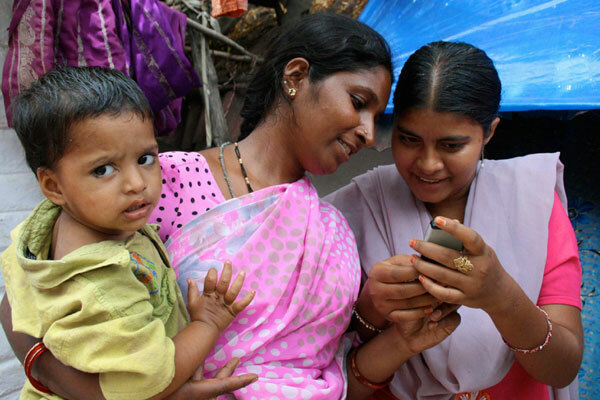 Look for charities that seek donations, such as hopephones.org. They refurbish old phones to donate to people in the developing world. You can pat yourself on the back for being green AND doing good. Do you recycle old teabags in a way that will wow us, or maybe you’ve turned landfill into art that’s now worth millions? Let us know by leaving a comment below. Don’t forget to sign up to our newsletter if you’d like to receive regular updates (the sign up form is right at the bottom of this page) and do come say hi on Twitter or Facebook. Super cute idea collection! I love the idea of spray painting cans. Thank you Katy – yes I really love that idea too. I saw another blogger do it in these gorgeous pastel colours – all different pastels. Then she tied ribbon around them and labels. Looked lovely…! Just thinking these would make nice gifts too! Great post! Now I know what to do with all those plastic bags clogging my cupboard. Thanks!